Unless you’ve been living under a rock, you’ve heard of the fantastic Audio Technica ATH-M50 headphones. If you still don’t own a pair, here are several different varieties on sale. It’s not the GorillaPod you’re likely familiar with, but everyone with a camera should have a small tripod like this for impromptu self photos or long exposure shots. Today on eBay, you can pick up the very capable GoPro Hero3+ Silver Edition for $245, or about $55 off the usual price. If you can’t be bothered with babying your phone, LifeProof cases will keep it safe no matter the situation. For a limited time, you can save 25% on the model of your choice. Ready to cut the cord? If you live in a city, the Mohu Leaf is a perfect, discrete antenna for picking up local broadcasts. It’s only about $4 off, but non-refurbished models rarely go on sale. The brand new Braun 390cc–4 shaver is $50 off, today only. There aren’t any reviews on this model yet, but similar Braun shavers are very highly rated. In fact, it's the step down model of the Commerce Team's favorite razor; the main difference being the lack of included cleaning system. Update: Just kidding! It does come with a cleaning system! 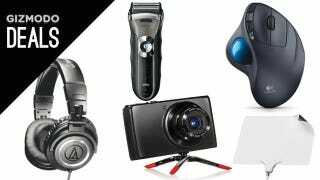 Today's Gold Box Deal is all Logitech, featuring everything from mice to webcams. There's even something for trackball fans. Also listed in the peripherals section. If the idea of a smartwatch isn’t appealing to you just yet, here’s a really nice regular watch for a great price. AnyFont ($1) | Normally $2 | Install new fonts on iOS. Yes, really.